Extract from Fighting In Hell – the German ordeal on the Eastern Front edited by Peter Tsouras first published in Great Britain in 1995 c Greenhill Books. The Soviets achieved all of their objectives last turn. Attacks pinned the German main thrust to Vologda and the penetration gained the bonus of eliminating half the German Rail Siege Guns. Elsewhere massed ranks of katyusha and Tanks corps forded the Volga canal and threatens German communications around Moscow. In the South the drive over the Don cut off the German spearhead probing towards Stalingrad and other units isolated German forces South and East of Rostov placing the city back in supply. Weather Roll = 6. Zones A and B now Mud! Finland & The Army of Norway: In the far north and central Finland troops move into a defensive posture as Soviet forces slowly increase. In the south Finish forces move back into the centre as fast as possible. The 16-10 panzer unit is impotent on its own against the solid ranks of Soviet armour, artillery and infantry slowly moving forward and harrying the retreating Finns. 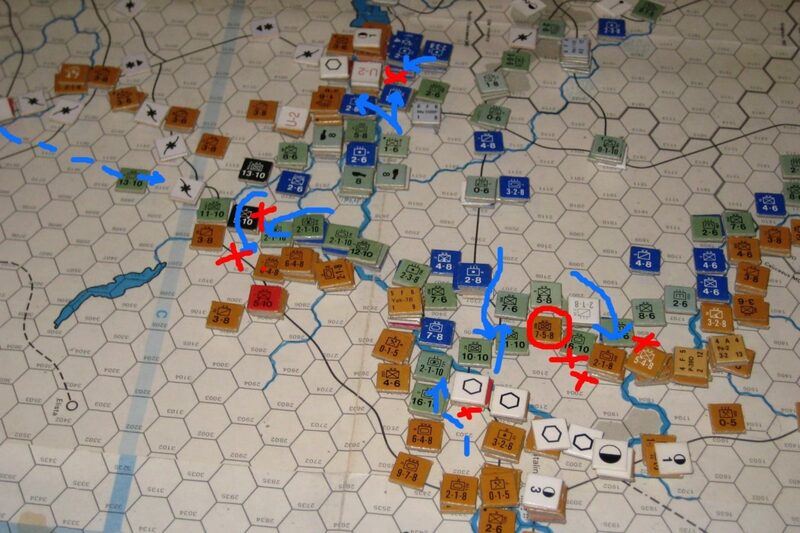 AGN A low odds, out of supply attack thrusting directly north dislodges the Soviet defenders and allows advanced elements to occupy a second hex of the Leningrad/Vologda rail line placing 50 miles of Soviet front out of supply. The combination of persistent rain turning the roads to a thick cloying mud and the Soviet penetration of the front to a depth of 30 miles halts the German move east. Forces organise local counter attacks and eliminate the two 6-4-8 Tk corps which overran the Rail Guns and the 9-7-8 Tk corps tethering them to the main Soviet lines. The infantry probe westwards towards Kalinin is also eliminated by local forces at hand. However the main Soviet thrust west of the Volga canal north of Moscow remains a serious threat. Two infantry divisions and a few flack and construction units are all that are at hand for the defence to supplement the cadred remains of the fortified line. A hastily rebuilt 12-10 panzer helps stem the tide but with most mobile units embroiled in combat and/or mired in the mud no other help is at hand. AGC: Units shuffle north but reduced mobility limits the help that can be transferred to Moscow. AGS: A second attack is launched against the now weakened defenders of Stalino. Most are eliminated but Soviet Commissars lead surviving guards units into the cellars and rubble of the city which remains in Soviet hands. A mixed force of Axis Infantry and artillery reduce another fort adjacent to Rostov and a low odds attack pushes further into the swamps south of the Don. The deep German probes into the Caucuses are recalled against the threat of the building mass of Soviet troops moving north. Further north the Axis mobile forces east of the Don fight for survival and a swirling battle develops on the East bank and the victorious but weak German mech forces re-establish a line screening the Don south of the city from the Soviet tank corps which are now released back into supply. The armour probing towards Stalingrad executes a fighting withdrawal and reaches the single hex bridgehead held by infantry and a Mech division. Between these two actions two trapped panzers manage to engage a Soviet mountain division and reach the relative safety of the Don crossing back west in the exploitation phase. However it is in the great bend of the river Don that the Axis force s extract their most devastating revenge. The Soviets had established a screen line across the river in an attempt to isolate German forces east of it and the Axis infantry lining the west bank. This they achieved but in a tactical move for which they are famous the Axis forces execute a backhand blow against the overextended Soviet forces. The infantry detach from the river and move west and German reinforcements and the last reserve units moved east trap the Soviet advanced forces in a vice. Two tank divisions are eliminated along with a number of tank and motorised infantry regiments. An old style Mech division is isolated and the majority of the Soviet forces west of the river are removed as an effective fighting force. Air War: Although not without activity with a number of fighter/bomber interactions especially on the main Moscow Front little losses are inflicted and both sides loose just one unit each.